Board Of Immigration Appeals Holds That A Dropped Pretrial Intervention Charge Can Serve As A Conviction. Consider this: You are a Lawful Permanent Resident who has lived in the United States for nearly your entire life. You have always been in the United States legally. One day, you get arrested for a crime you did not commit. Or maybe you did violate the law, but it was a very minor charge and you have never been in trouble before. Like so many United States citizens in the same situation, you are offered a pretrial intervention program. That is, the prosecutor diverts your case from the court system, has you perform some community service, pay some fines, maybe take a class, and if you complete all of the requirements, they drop the charges. Under the laws of the State of Florida, you would even be able to get the charge expunged from your record. After all, the law in this land of opportunity is set up to give people second chances when they make a mistake. So, you enter the pretrial diversion program, do everything you were asked to do, successfully complete it, and the charges are dropped. All is well, right? 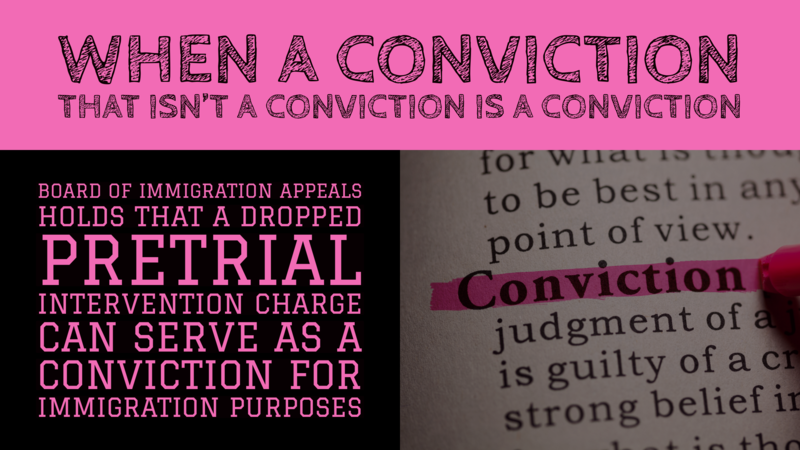 What is the definition of a “conviction” for immigration purposes? This is different than the definition of a criminal conviction under Florida law. For example, under Fla. Stat. §775.13(1), the term “convicted” is defined in regards to a felony offense as “a determination of guilt which is the result of a trial or the entry of a plea of guilty or nolo contendere, regardless of whether adjudication is withheld.” So, under this section of the Florida criminal statutes, an actual plea of no contest or guilty or a jury verdict of guilty is required for a conviction. So, because the federal definition in the immigration context is different that the Florida definition in the criminal context, non-citizens, and their immigration lawyers, must conduct a more in-depth analysis of the pretrial intervention agreements before entering into them. What actions in a state criminal case qualify as a “conviction” for immigration purposes? On September 5, 2017, the Board of Immigration Appeals, in Matter of Mohamed, 27 I&N Dec. 92 (BIA 2017), considered whether a criminal case that had been dropped pursuant to a pretrial intervention agreement could still qualify as a conviction for immigration purposes. Mr. Mohamed, a citizen of Somalia was lawfully admitted into the United States as a Lawful Permanent Resident with a greencard. Approximately eight (8) years after his admission, he was charged with possession of a controlled substance with intent to deliver in Texas. Mr. Mohamed entered into a pretrial intervention agreement and agreed to two years of community supervision, 100 community service hours and other fines and costs. The important portion of the agreement was a stipulation by Mr. Mohamed to the evidence, so if he violated the agreement, the State could use his admission against him and he agreed to an automatic conviction. Mr. Mohamed swore to the evidence before a clerk and the agreement was signed by his criminal defense attorney, the prosecutor and the presiding judge all verifying that Mr. Mohamed made his admission freely and voluntarily. Mr. Mohamed successfully completed the pretrial intervention program and the charge was dropped. Mr. Mohamed was still placed in removal proceedings and the Immigration Judge held that his pretrial intervention admission was not sufficient to qualify as a conviction for immigration purposes. The Department of Homeland Security appealed to the Board of Immigration Appeals. The BIA sustained DHS’s appeal and reinstated removal proceedings. The Board noted that whether a criminal charge is a conviction for immigration purposes is a matter of federal law and does not rely on the state definition of a conviction. The Board went on to determine that first, the conviction was withheld under the definition of INA §101(48)(a) and second, the judge ordered some punishment, penalty, or restraint. The Board determined that Mr. Mohamed’s sworn admission to committing the elements of the offense and stipulation that a violation of the pretrial intervention program would result in an automatic conviction were sufficient to be considered a conviction for immigration purposes. Also, the Board held that Mr. Mohamed’s pretrial intervention obligations were a sufficient form of punishment to satisfy the definition of a conviction for immigration purposes. 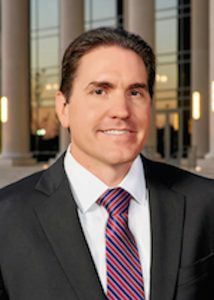 What can be done to avoid the pretrial diversion case from being considered a conviction? It should be noted that every jurisdiction has it’s own process for pretrial intervention agreements. It differs from state to state and even from county to county. In some jurisdictions, you are required to admit all of the elements of the offense in order to obtain pretrial intervention and in some jurisdictions, you aren’t. In some jurisdictions, a very formal back and forth occurs between the judge and the defendant. In some jurisdictions, there is no sworn admission to any facts. In many cases, your criminal defense attorney may be able to negotiate whether an admission is made and/or which facts are admitted and which ones aren’t. It is important to discuss the language in the pretrial intervention agreement and what admissions will be required with an immigration lawyer to determine the likelihood that it could be considered a conviction for immigration purposes.